In-Home Piano Lessons and In-home Guitar Lessons in San Diego. Learn To Play Piano/Keyboard or Guitar (Electric/Acoustic) today (absolute beginners after the first session will be playing a song already), or improve your musical skills, or learn how to start generation some cash with your skills. 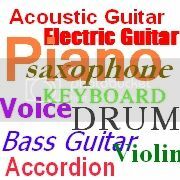 Have students age from 4 to 60 years old taking piano, electric/acoustic guitar, drums, recorder, clarinet, violin, and bass guitar. We make music fun for the kids!!!!! For in-home Lessons in San Diego, tuition is only $30 for 30 minutes. One hour, 45 minutes, or 40 minutes sessions are also available. Lessons can be one a week or more often for faster results. SUMMER CAMP JUNE 14th-AUGUST 9th: We are also offer Group Lessons for Children K-12th grade. These are ONE Hour lessons. We will meet every Monday, from 4:00 to 5:00pm. For more information or to register, please click here. This is a fun way to learn Piano/Keyboard or Guitar (Electric/Acoustic) during Summer, in a social environment. We know how to teach! I understand that people have different learning styles (Auditory, Visual, Kinesthetic) and how to adapt the class to these styles. We will customize the lesson plan for each student to maximize musical progress. We are professional musicians and full-time instrument instructors with over 20 years of international teaching experience. We teach in schools (group lessons) and in home (private lessons). The very best in both, quality and convenience. All ages, levels and styles are welcome. Learn to play the instrument, to compose, to listen, to sing along, to read music score and tablature (for guitar and bass), to record, to perform, and stage skills. If you are committed (as we are) and would like to enjoy the benefits of music education for you and/or your children, please send us an e-mail to request more information. Learn Piano in San Diego. Learn Keyboard in San Diego. Learn Acoustic Guitar in San Diego. Learn Electric Guitar in San Diego. The Guitar (Electric/Acoustic) program is a combination of Practice and Theory.